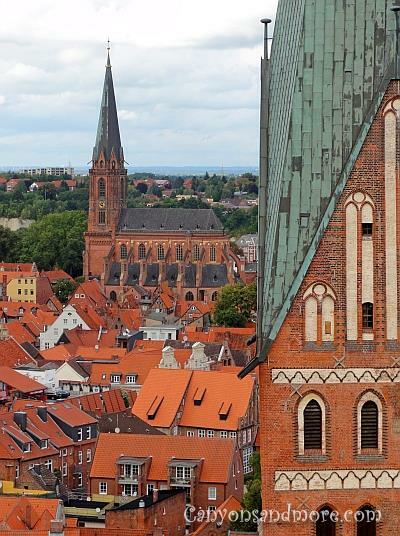 Lüneburg is located in the state of Lower Saxony in Germany and is a gem of a city to visit. The area around Lüneburg is already spectacular for its “Heide” which are fields of heather. But the city itself is a must to see if you are intersted in architecture of the middle ages. 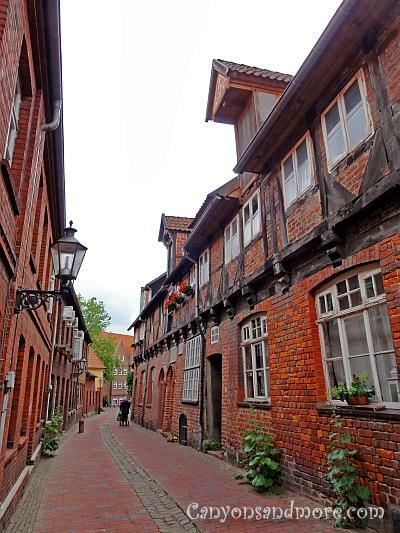 Today you can walk the side streets and alleys of Lüneburg and feel like you are going back in time. During the middle ages Lüneburg achieved much wealth because of its salt supplies and trade. This wealth is reflected in the architecture of the city. When you look at the buildings, you will notice the gothic red brick style and the detailed arched windows. These were not built for peasants but for those with money. Because the city was not damaged during the 2nd world war, you see many of the structures built during the middle ages. Some of these have the years engraved on them and are still in great condition. There are other historical areas of the city where it is obvious that the less wealthy workers housed. These buildings are maybe not as “fancy” as those of wealth, but are also interesting to look at just the same. In the image above you have a view from the Lüneburg water tower over “Am Sande” (a popular street in Lüneburg with many historical structures.) It is the the row of buildings across the middle of the image. Look at the interesting architecture of each of the buildings. 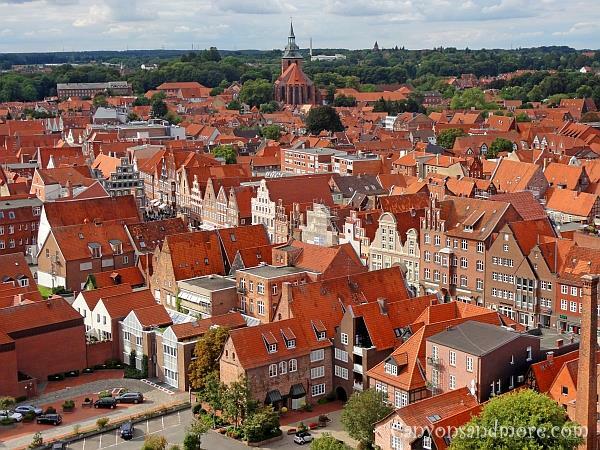 Lüneburg is obviously a city of red rooftops. When the sun is shining, it just seems to glow. In the background you can see the St. Michaelis church overlooking the city from this point of view. ”Am Sande” is a street in Lüneburg that is a tourist attraction for itself. When at the location, you can see beautiful historical buildings that grace the street with a feel of the middle ages and the details of these buildings are worth paying attention to. Fancy deep arched windows, gothic red brick style beautify the buildings and even some buildings are crooked and sinking because of their age. It all adds to the charm of the street. 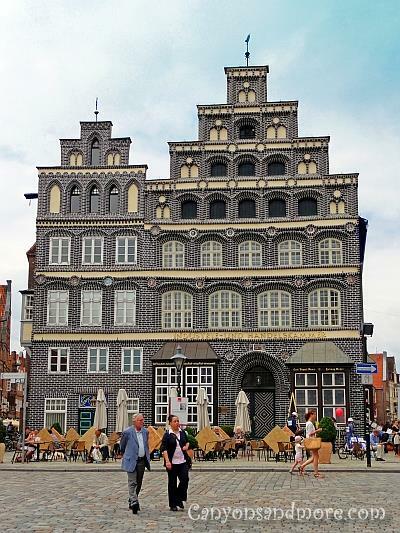 At the height of the street you have the fancy and impressive lookign chamber of commerce building in its black brick gothic style overlooking Am Sande. In the summer, you can sit there and refresh yourself. Then at the other end of Am Sande, the St. Johannis church stands out and keeps watch over the city. The attention that was given to the to arches around these windows is charming. This building is the “Bäkerei Konditerei Hesse”. There is an inscription on this building which reads “Backhaus seit 1493”. Which means this has been a bakery since 1493. 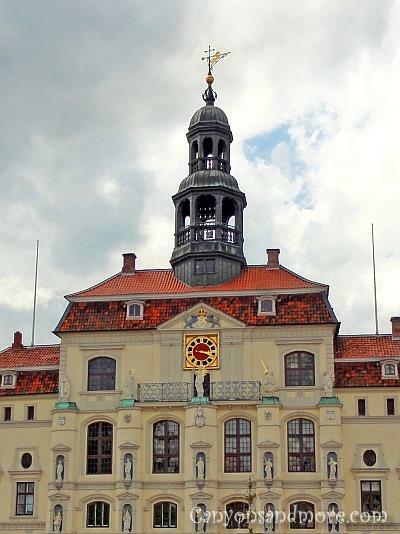 This building can be found on “Am Sande”, which has several historical structures located on it. The details of this building show the amazing “Backsteingotik” or brick gothic style which was typical of the time in which it was built. 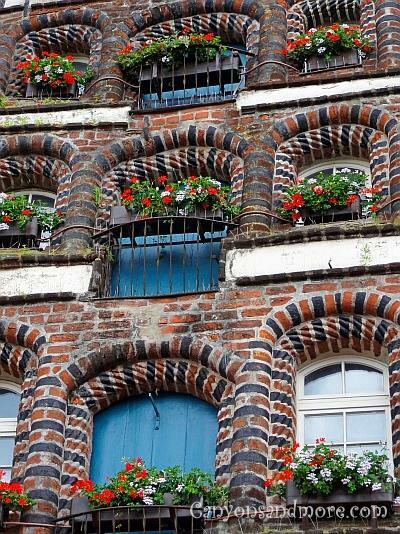 In the northern states of Germany and some parts of Holland, this typical type of brick “art” was popular between the 12th and 16 centuries and used on houses and churches. 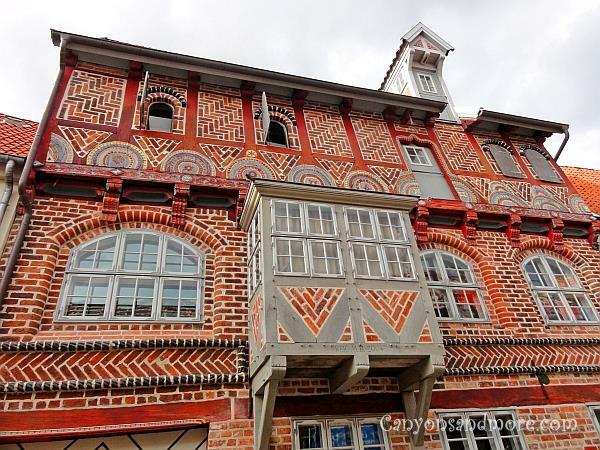 It is amazing to see these structures and Lüneburg is full of such buildings and you can just feel the wealth of those having their homes decorated this way. 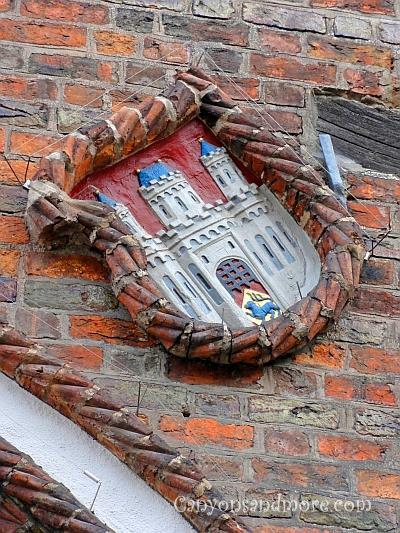 This is the city crest of Lüneburg located on one of the buildings found in the city. Small wooden timbered brick homes fill many alley ways of the city. Many of these homes are ancient structures and because they are more quaint in their looks, they were probably the homes of the salt workers of the city during past centuries. 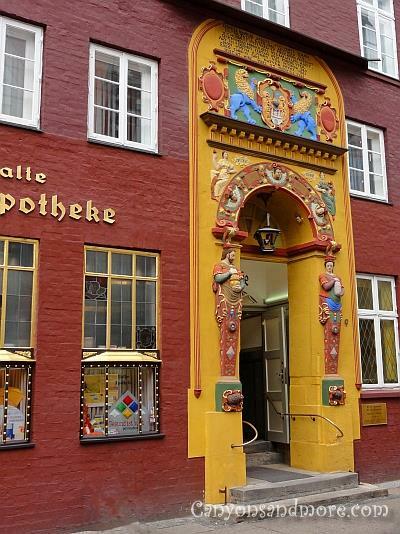 This is a gorgeous entrance to the “Alte Raths-Apotheke which is an old apothecary or pharmacy that was built in 1598. The time it was built was still the red brick gothic time that was popular in the north of Germany. That is not seen here. During the Renaissance and Barock times of Europe, the red brick look became unpopular and was replaced with white plasterwork. It is assumed that this front was added afterwards during these times. This house was seen while walking towards the water mill of Lüneburg. 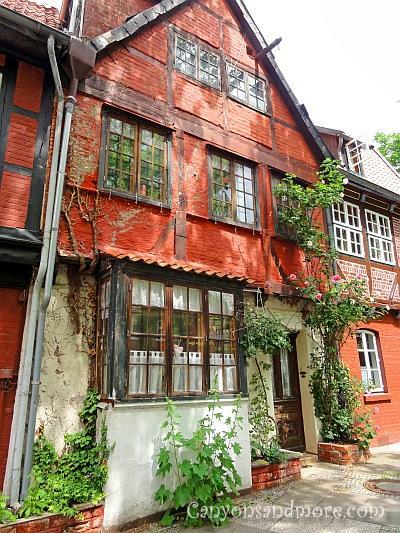 The house looks old with its wooden timbered structure but no date is engraved on the building as is common with many of the buildings located in the city. It is just one of the many charming structures found in Lüneburg if you take the time to walk through it. When you are at the top of the water tower, you can capture many fantastic views of Lübeburg and the area all around it. In this image you have the St. Johannis church right in front of you and in the background is the St. Nikolei church.